Leopard geckos (Eublepharis macularius) are smallish lizards that hail from regions of the Middle East and south Asia, from Iraq to Pakistan. The nocturnal and robust creatures are common in an assortment of different settings, including grassy locales, rugged deserts and scrubland. Leopard geckos are widespread in captivity as pets. Leopard geckos typically breed between the months of January and September each year. Female specimens are capable of stashing sperm away until circumstances are optimal for breeding, sometimes for over 15 months. They favor muggy and wet weather for depositing their white, circular eggs. The incubation process lasts for roughly two months. Their clutches in the vast majority of cases are made up of pairs of eggs. Some clutches are made up of a single egg. Female leopard geckos can often have as many as five clutches each reproductive season. Temperatures during incubation decide the sexes of leopard gecko offspring, as with lots of their fellow lizards. Temperatures of around 80 degrees Fahrenheit typically make for girls, while higher temperatures of approximately 90 degrees typically make for boys. The middle point between those two temperatures generally leads to both sexes in similar amounts. Leopard geckos at birth are usually around 3.5 inches in length. They refrain from eating during the earliest days of their lives, instead surviving off unconsumed yolk supplies. After the offspring shed, they consume the old skin, as it is beneficial for their growth and development. They then start to regularly look for insect meals. It takes the little guys between 16 and 25 months to attain reproductive maturity. Once leopard geckos are mature, they typically start reproducing promptly. Male leopard geckos attempt to woo females for breeding by nipping and licking them. They also use their mouths to seize the females' necks. 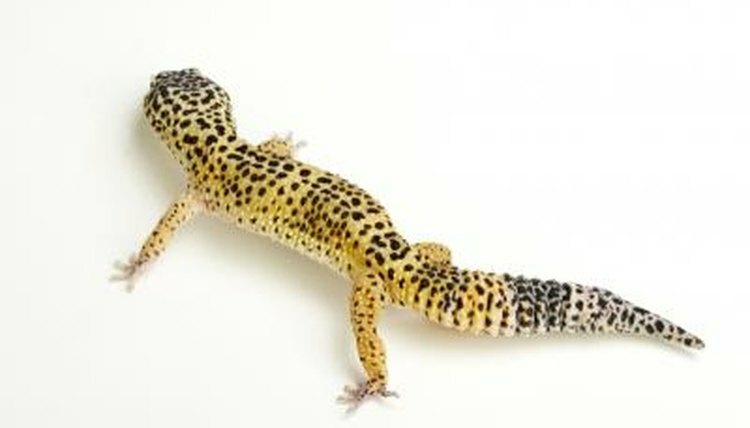 Female leopard geckos that are willing to mate respond by elevating their tails. The males don't usually mind female visitors to their individual turf, but often become extremely fierce around trespassing males. Females, in contrast to the males, aren't usually aggressive. Leopard geckos in captivity often have longevity on their sides. Some specimens are capable of surviving for more than three decades. The typical life-span for free-roaming individuals, however, is uncertain.